Killer Characters: Do you foresee trouble before it happens? Do you foresee trouble before it happens? Did I tell you about that? I don't think I did. My mind is whirling lately. We're so busy. Tourism is booming, and the shop is thriving. Anyway, we're hosting the Grilled Fest in Crystal Cove. This year, it'll feature grilled cheese. We'll have cook stations in the shop, and people can come watch the contestants vie for the top prize. The winner for the last eight years has been the woman who runs Mum's the Word Diner, the one I mentioned before. I know the other competitors would really like to see her lose. We'll have to see what happens. Things could heat up fast! Last year, she and the runner-up got into a spatula fight. It went viral on YouTube. Too funny! 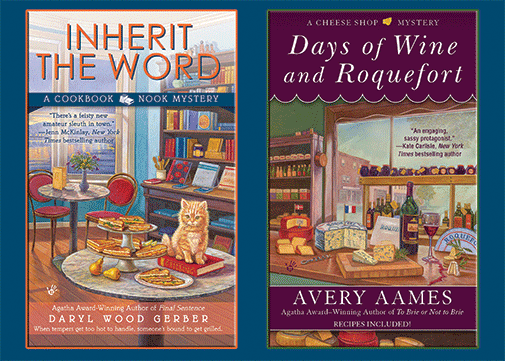 By the way, my author is offering a giveaway today of the book that came out last month, DAYS OF WINE AND ROQUEFORT, the 5th in a Cheese Shop Mystery series. She writes that under the pen name of Avery Aames. So leave a comment with your email address, so she can contact you if you win, okay? Check out my virtual blog tour via my event calendar. Lots of book giveaways coming up! 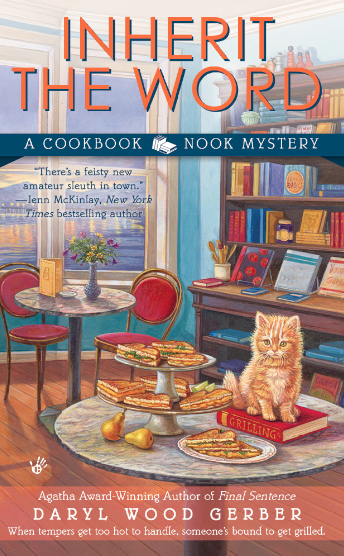 Also check out Mystery Lovers Kitchen tomorrow. There will be a book giveaway on that, too! Very best wishes on both your books! They are (obviously) delicious sounding temptations. Libby, thank you so much. I always love seeing your name among the commenters. Thank you, Lucy & Haley. We're very excited. Congrats on both, I love both series but way behind on the Cheese shop...I'm determined...I'll get there (and have fun doing it). Do I foresee trouble? Well, when my kids were young and they were quiet, I knew trouble was coming, LOL. Debbie, that's like it is with pets. When they're quiet, they've found something to chew on that they shouldn't be chewing on, right? Yipes. Both series are "wanna" books. As soon as I can I wanna get 'em. And I am in awe of the fact there are two (count 'em) two books at the same time. You are one talented and busy lady. Thanks, Annette! So glad you chimed in. Amazing what the publishers expect us to be capable of and we say "yes"!!! Love your books. You alway deliver a great book to read. Looking forward to reading Inherit the Word! The first book in the series was a lot of fun. Jenna is a great character. Renee, I'm having such a good time getting to know Jenna better. It's one of the true delights of being a writer. Barbara, thrilled to hear! Thank you so much. The book is getting good press. Yay! And the winner of the giveaway is Bobbi! Congrats, Bobbi. I'll be contacting you via email. 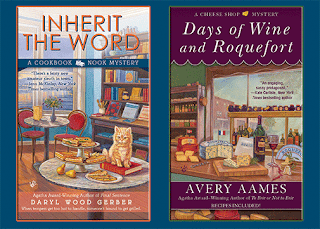 I hope the rest of you will drop by Mystery Lovers Kitchen for a recipe and more giveaways! I want to devour both series---and with my retirement coming up in 2 weeks---I'm ready to start reading many, many books! Please enter me in the drawing.